On Tuesday, Chick-fil-A on Mitchell Hammock Road held their first Drive-Thru Dog Show from 2 - 4 p.m. Over 60 dogs and their owners participated. The winner will be announced Friday on Facebook. Even under the gloomy skies, the local Chick-fil-A drive-thru is full of smiles, laughter and the sounds of dogs barking. 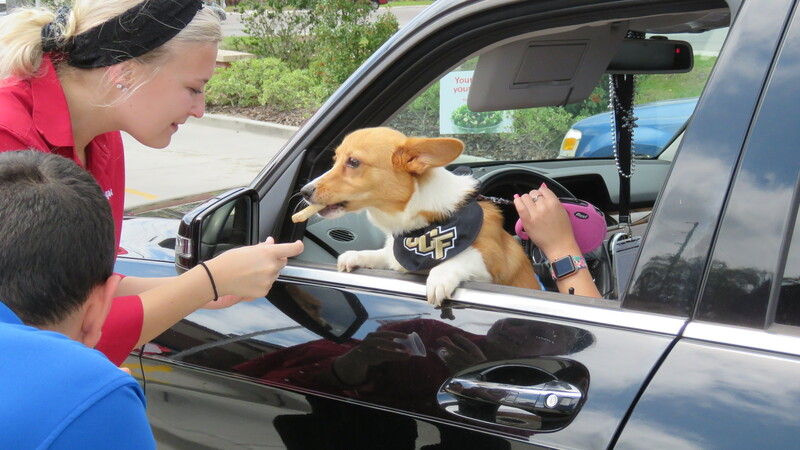 On Tuesday from 2 – 4 p.m., the Chick-fil-A on Mitchell Hammock Road held their first “Drive-Thru Dog Show.” Over 35 guests and over 60 dogs came out to participate at the Oviedo location just north of the UCF main campus. “It would be a really great way to have people in Oviedo feel like they’re a part of Chick-fil-A, and that’s what our goal is today,” said Skylair Davis, a shift leader and social media manager at the Chick-fil-A. Some owners brought one dog while others brought up to five. Kevin Heckle, a regular at the Chick-fil-A and political science UCF alumnus, brought his two dogs, Keeper and Olive, to the event. He said he comes almost every other day and his dogs come at least three times a week to the location. “It’s always good to have an event to bring your dog or people out to have lunch with your family,” Heckle said. Owner’s contact information was taken along with a photo of the dog or dogs. Pups were also given the choice of either a Milk-Bone treat or some carrots. The photos of the dogs will be uploaded to Facebook. Whichever dog’s photo gets the most likes by the end of Friday, April 5, will win a “doggy prize pack,” which includes promotional bandannas, water bottles, dog bowls and shirts. The dog show was Davis’ idea. He said he thought the event would bring more community engagement to the location. The Oviedo Chick-fil-A already hands out treats daily to dogs who come through the drive through. Davis said he thought the event would also bring in more customers during the slower hours between 2 – 4 p.m.
Melissa Bills, the marketing director of the Mitchell Hammock Road Chick-fil-A, said during those specific hours there’s a significant decline of customers compared to the busy lunch hours of 12 – 1 p.m. On Monday, the number of cars that came through the drive-through was 85 from between 2 – 4 p.m. while the lunch hours were around 120 – 140 cars. The event brought dozens of guests and their furry friends who don’t normally come to Chick-fil-A during those hours. Davis said the event caused the drive through to be much busier than normal which was helpful to the restaurant. Extra staff was also called in to ensure there were enough hands to help take photos and food orders. The event was promoted on Facebook and was engaged with 10,000 times, Davis said. To engage with the page it was either viewed, liked, shared or commented on. He said it was the biggest Facebook post the Oviedo Chick-fil-A has had so far since opening. The marketing team hopes to continue doing dog shows in the future. Davis said if they were to do so, the time would likely change from 2 – 4 p.m. to 5 – 7 p.m. He said due it being after work, people will be available to come during dinner hours to double the number of dog owners who came on Tuesday.